Volunteer Park sits atop the highest point of Seattle’s Capitol Hill with sweeping views of Puget Sound and the Olympic Mountains—a jewel in the city’s parks system. A loop drive and winding trails designed by the Olmsted Brothers was added in 1904–05, with trees and plantings laid out in their traditional naturalistic style. Seattle residents wanted a botanical conservatory the likes of which they had seen in Europe and at the 1909 Alaskan-Yukon-Pacific Exposition held on what are today the grounds of the University of Washington. Volunteer Park Conservatory, also designed by the Olmsted Brothers, was completed in 1912 and modeled after the famed Crystal Palace in London. The conservatory was erected from a $5,000 glasshouse kit from Hitchings & Company, a New York company in partnership with the famed Lord & Burnham Company. The finished structure contained a 6,800-square-foot public house as well as 12,000 square feet of greenhouse and production area for propagation, growing, and primping plants behind the scenes. After laying the foundation, building and installing the heating plant, and glazing, the final cost was approximately $50,000. Coal-fired boilers fueled the original heating plant and required constant on-site staff during winter months; the heat source was later switched to oil in the 1960s and gas in the 1970s. The one and one-half miles of hot water pipe running under the benches of the conservatory and back to the boilers is still in use today. 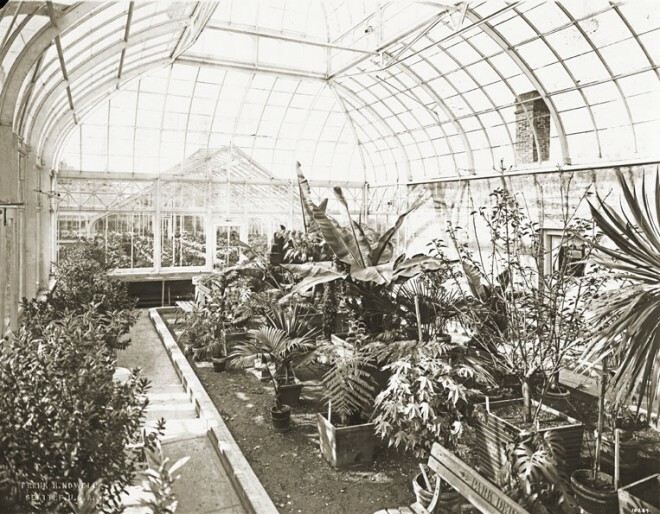 Growing greenhouses, added in 1922 primarily to house an orchid collection donated by Anna Clise, were closed a few years ago due to security concerns. In the late 1970s, a modern, electronically controlled growing house was erected and is used for all current production, ably staffed by lead gardener Jeanne Schollmeyer. The original supporting steel structure remains intact. Graceful wooden arches, originally crafted from southern swamp cypress, lasted nearly 75 years. Western cedar replacements lasted barely 20 years before succumbing to the 90 percent humidity. Partial renovations on the conservatory occurred in 1999 and 2006, but Seattle’s budget deficits of the last five years have placed further work on hold and jeopardize its very future. The small Victorian entrance features the original ornate beveled glass lunette window installed in 1912. 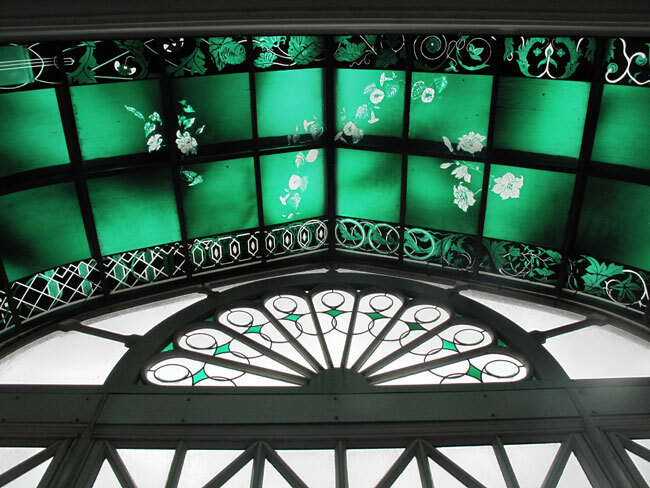 A hand-blown, stained glass canopy, designed by Richard Spaulding, entitled Homage in Green, was added to the vestibule in 1981. Additional pieces, also by Spaulding, were added in 1982 and 1995. 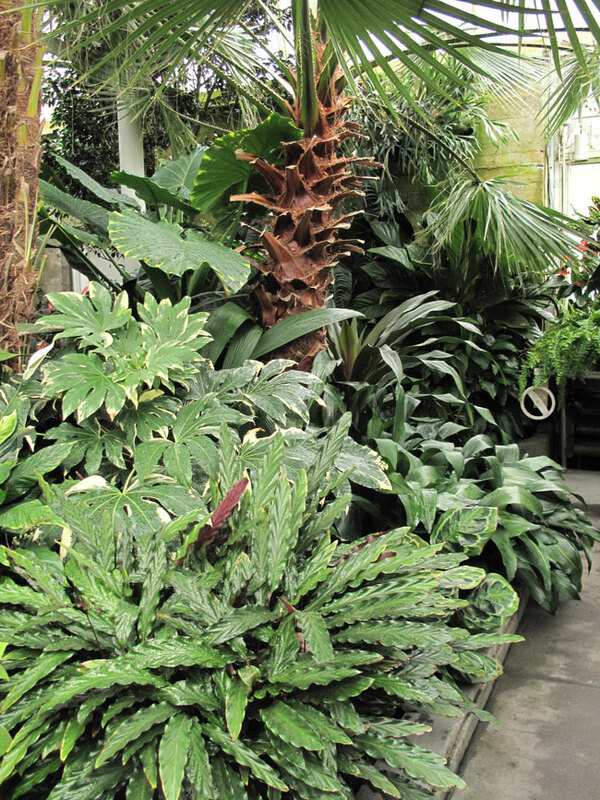 Once indoors, visitors encounter the beauty of exotic, tropical, and seasonal plant collections as the heat and humidity of the display environment spirit them away from our temperate Pacific Northwest climate. The Palm House, the central and tallest building, is filled with palms and their companion plants from around the world. Display cases filled with exotic blooming orchids are regularly changed out to enhance the show. Cameras are a must to capture the beauty. The Fern House is a green environment lush with exotic ferns and a babbling fountain. Judith Jones of Fancy Fronds nursery in nearby Goldbar, Washington, was instrumental in establishing the current collection. The Bromeliad House, where something is always in bloom, is filled with hundreds of bromeliads and their epiphytic relatives. A sculpture by sound artist, Dan Senn, entitled Over Lyre, is placed in memory of Shannon Priebe, a long-time conservatory supporter. A wrought iron tree designed by Randy Benson and crafted by local artists showcases a tillandsia display. The Seasonal House features major displays that change throughout the year: cascading mums in autumn, poinsettias during the winter holidays, followed by spring bulbs and Easter and exotic lilies. 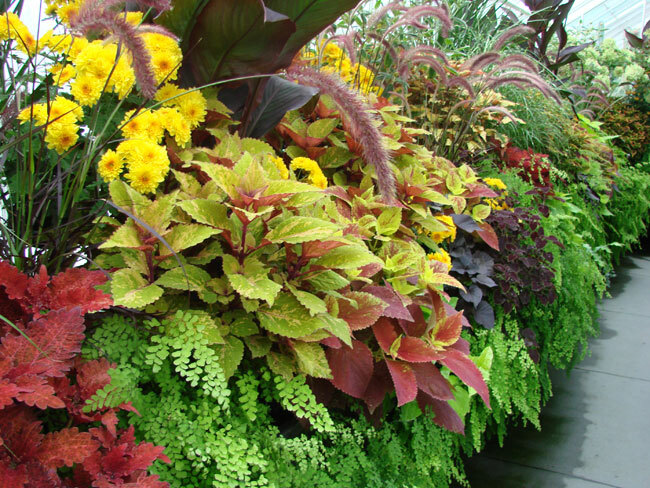 The display requires months of planning, growing, and rotating plants so they are always fresh. Seasonal House exhibits are under the direction of lead gardener David Helgeson following the retirement of his predecessor, Stephanie Tolliver-Jones, five years ago. 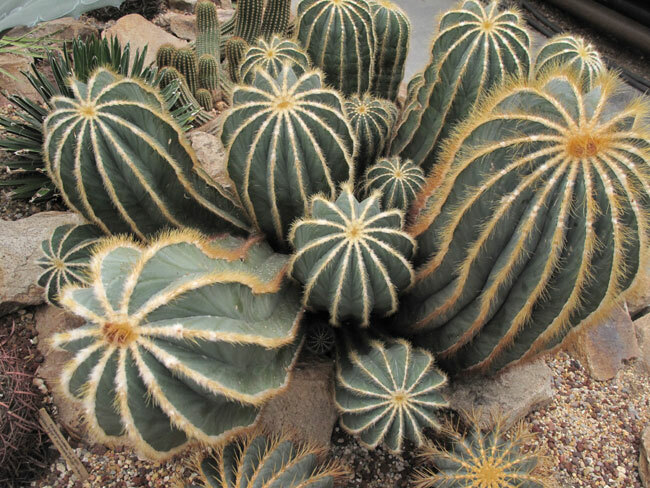 The Cactus and Succulent House is home to hundreds of specimens, large and small, and filled with blooms in season. Be careful you don’t get too close; those prickles just might go home with you. During its first 100 years, Volunteer Park Conservatory survived earthquakes in 1949, 1965, and 2001; weathered the brutal snow storm of 1916 that collapsed the dome of neighboring St. James Cathedral; and withstood financial crises and sustainability issues—a common plight for most public gardens. 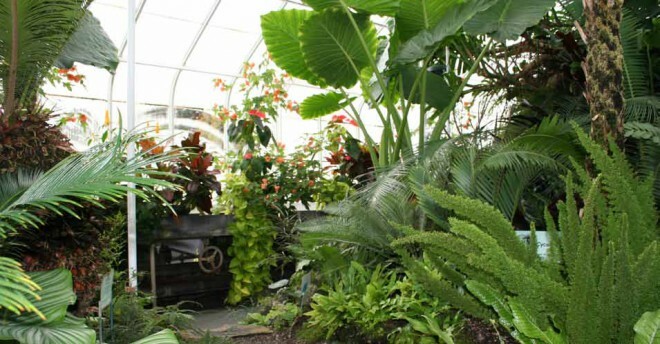 In 1978, a group of prominent citizens, horticulturists, and community activists formed Friends of the Conservatory (FOC) to raise funds and public support. Today, FOC sponsors two plant sales, in spring and fall, which are the only ones in the Seattle area featuring indoor/exotic plants. They offer educational lectures, tours and public programs, and operate a tiny, exquisite gift shop whose proceeds support conservatory operations. A Victorian celebration of grand proportions on a bright sunny day last August welcomed Volunteer Park Conservatory, one of Seattle’s most famous icons, into its next century. Last August, a sunny, summer celebration was held at the conservatory. 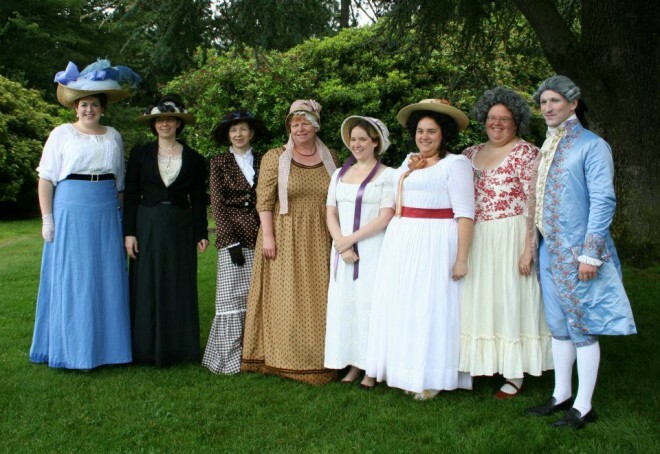 Period costumes, a croquet tournament, horse and buggy rides, high-riding bicyclists, and a John Philip Sousa band lent a festive air to the event. Seattle dignitaries toasted the occasion and attendees munched on a cake shaped like the Conservatory. Jubilant word had just arrived that Volunteer Park Conservatory was not going to be closed or torn down. A group of public and private organizations and citizens including Seattle Mayor Mike McGinn, the Department of Parks and Recreation, Seattle Parks Foundation, and Friends of the Conservatory announced an agreement to provide leadership and approximately $2.5 million in funding for a comprehensive restoration of the historic landmark. Volunteer Park Conservatory is poised to continue as a vibrant destination for locals and visitors for another 100 years. The inspiration and love of all involved will allow this Seattle icon to once again shine brightly on top of Capitol Hill.